Eed Banchanurat Landon, the Chief Chef at Thai by Thai, has been cooking traditional Thai dishes for as long as she can remember. Growing up in the center of Bangkok in a small business, she absorbed the lessons of great stir-fry from her Chinese-born father, how to make spicy Northeast Thai and Lao dishes from her nanny, and the importance of healthy, fresh ingredients from her eldest sister. Helping them prepare three meals a day for her lively family and employees meant going to the nearby street markets for fresh meat, fish and vegetables. She remembers as a little girl squeezing coconut milk from the flesh of fresh coconuts to make curries. 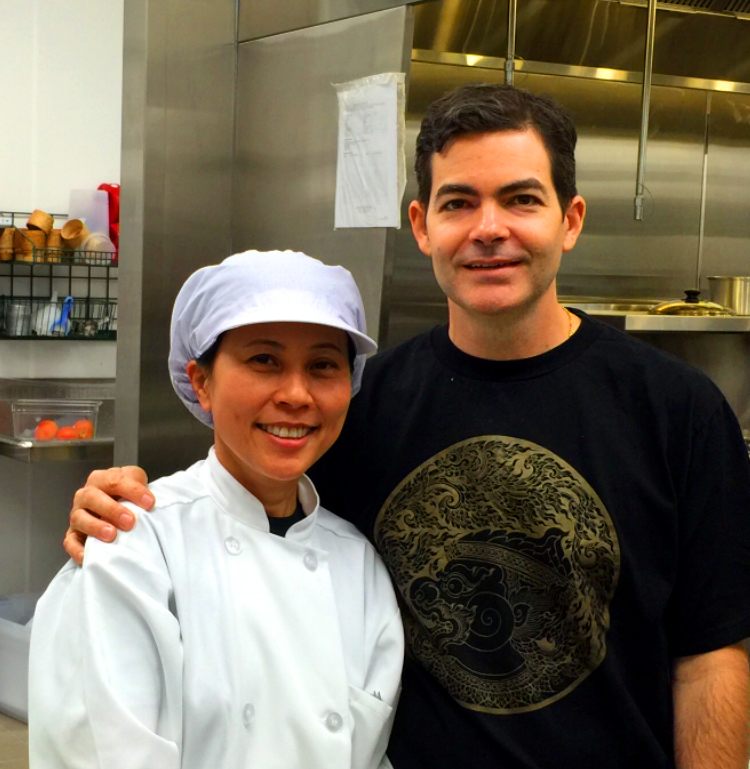 Eed continued to develop her passion for cooking while she studied for her MBA in Illinois, and it was here she met her husband Matt, who was studying Thai and SE Asian Studies. They moved together to Bangkok for a few years, where Eed worked at IBM Thailand, before returning to the US with their young son. When Matt began law school in Ithaca, New York, Eed spent the long winters cooking Thai dishes and mastering her craft, using Matt as her very willing taste tester. After settling in Washington DC in 1997, Matt and Eed bought a Subway franchise in Fairfax City. She was initially attracted to Subway by the focus on healthy food, and they later bought a second franchise. In 2007 they opened the first Thai by Thai restaurant in Sterling, basing it on the same type of restaurant she and Matt loved to frequent themselves. Kid friendly, casual, quick service, and great food. The focus on quality ingredients and authentic Thai dishes not typically available in the U.S. rapidly made it a huge success with the local Thai community. Eed and Matt soon expanded by opening a new restaurant in Fairfax City in 2010, followed by two more in Annandale and Dunn Loring Metro Station. Eed oversees each location, sets the menu, chooses the ingredients, and supervises the chefs to ensure each restaurant benefits from her extensive experience and unique style. Eed and Matt have always tried to incorporate innovative and healthy concepts into their restaurants, such as using canola oil from the time they first opened their doors, adding a gluten-free menu, and now using cane sugar-based soft drinks. With the business expanding, Matt left his career as a securities lawyer to help full-time. Matt will soon be growing organic herbs, such as basil, chili peppers, and lemongrass to supply the restaurants. They are thrilled to be able to share their love of Thai cuisine with more people as Thai by Thai continues to grow and thrive.